Was Jesus gay? That’s the implicit question posed by our cover, which depicts the Son of God wrapped in a rainbow shroud. The image, photographed by Kourosh Keshiri and designed by Anna Minzhulina, is arresting and provocative. But that raises another key question: why should it be controversial to portray Jesus as a gay man? 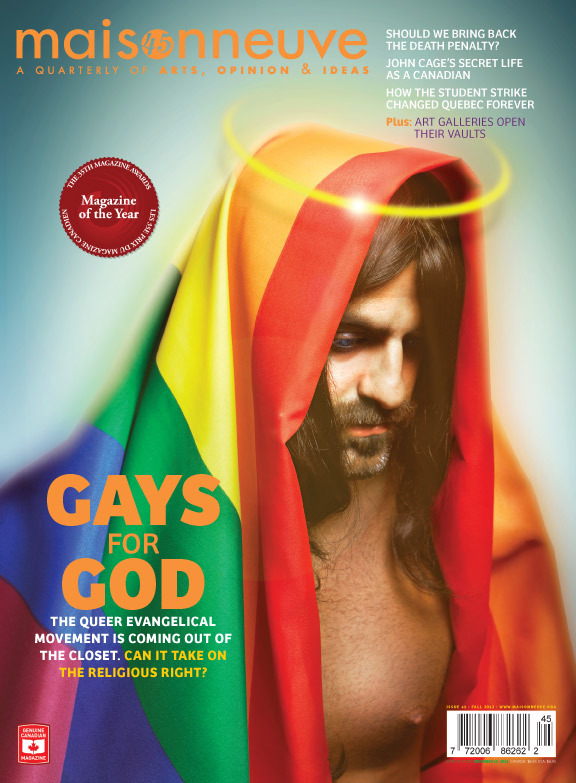 Based in Canada, the magazine will reach newsstands Sept. 17 with a “Gays for God” cover about the queer evangelical movement challenging the homophobia of the religious right. Special thanks to Terrence Weldon of Queering the Church for alerting me to this striking image. He has already blogged about it in a wide-ranging post titled Gays for Jesus: Catholic and Evangelical. Homosexuality is not an affirmation of gender but a deprivation of it. God is not a deprivation.